As you may have noticed, I haven’t been posting as much lately because my friend Sandy and I are hard at work writing our ice cream cookbook. Yep – a tough job, but somebody has to do it! All that taste-testing…..!!! We are developing lots of healthy options, great for all of us who have allergy issues and/or just want a healthy substitute for the full sugar/fat/dairy version. We’ll keep you posted on our progress, but in the meantime, we’d love to hear what everyone’s favorite flavor is. Shoot me an email and we’ll work on transforming it to a healthier version so you can enjoy a guilt free treat! Remember, back in the day, when the leaves would begin to fall and the breezes started turning cool, what would we all start thinking about? Pumpkin. Pecans. Pies straight from the warm oven, the house smelling of cinnamon. Was there any better way to welcome the change of seasons? Around our house, my friend, Phil, and I always turned to our favorite recipe, Pumpkin Chocolate Chip Mini Muffins, to start off the holiday baking. I think I started the tradition, then he carried it on, both of us making countless little pumpkiny treasures with just that little bit of chocolate to surprise the eager recipient at our respective offices and Halloween parties. From then on, it was all about the pies – pumpkin and pecan, of course. “Yes, of course, I’d love a small piece of both please. After all, it’s the holidays!” Before we even got to dive into the Christmas cookies, we’d all be feeling awful, already putting on our holiday “puffiness” and stressed to the max from all those carbs and sugar. Well, times have changed. When you know better, you do better. The leaves are falling and the breezes are just beginning to cool, so it’s time to create new traditions. Don’t be tempted to fall back into old habits that may sabotage your Primal progress. Instead, reinvent your traditions, use your favorite ingredients, and transform them to something unexpected. 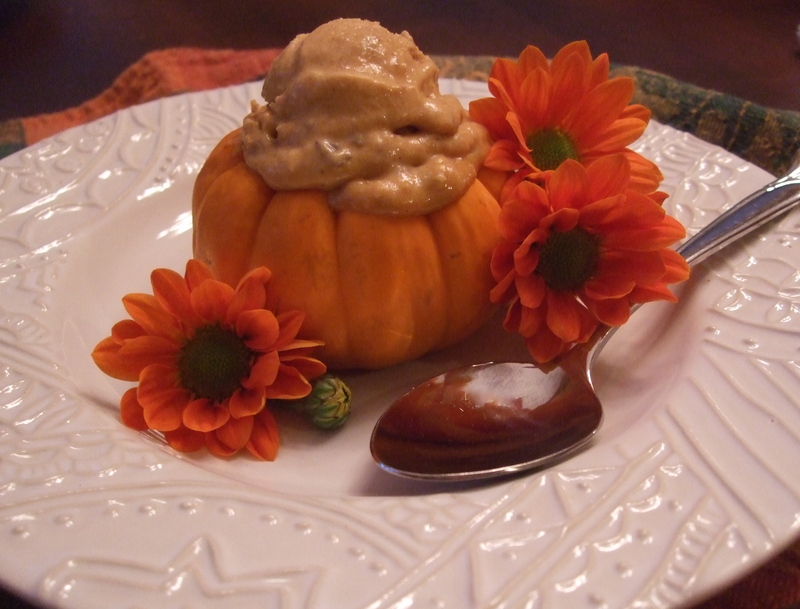 As a twist on my favorite dairy-free ice cream recipe, I decided to add pumpkin to help usher in the fall season as quickly as possible. I included pecans and coconut because when toasted, they take on such richness and added dimension, and they provide a great contrasting crunch to the creaminess of the coconut milk and pumpkin. For flavoring, I used vanilla paste along with a bit of vanilla extract. I like using vanilla paste for the smooth flavor it brings, and besides, it’s just really cool stuff! 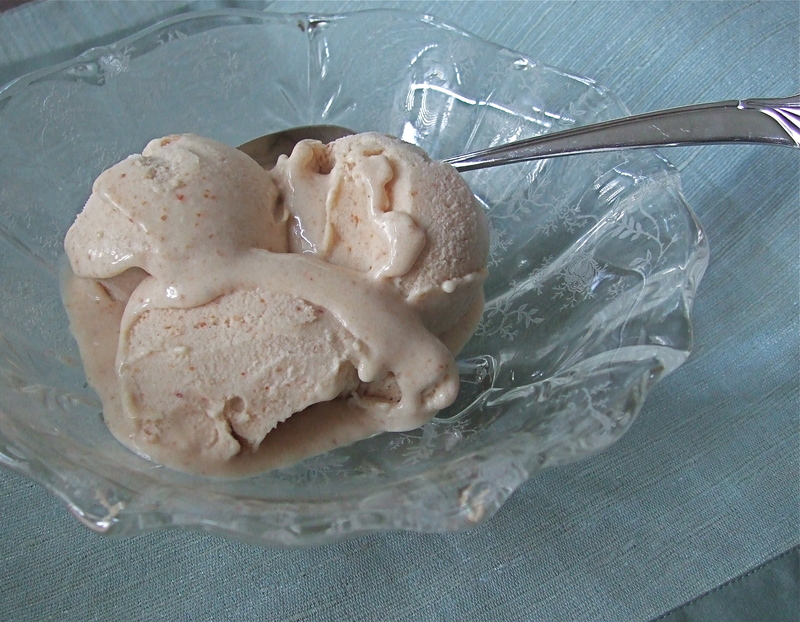 I love seeing all those tiny little specs of vanilla bean in the ice cream – it makes it all a bit more special. (Using just vanilla extract works fine, too). As for adding some flecks of chocolate, well it’s chocolate. ‘Nuff said! Preheat oven to 350°. Line an 8×8 baking pan with foil, place chopped pecans in pan and toast in oven for approximately five minutes. Keep an eye on them, and as soon as you get a whiff of toasty nuts it’s time for them to come out. Put nuts into a bowl and set aside to cool. Pulverize coconut using a mini chopper and put into same baking pan and toast. Do not step away from the oven! Seriously, it takes only a few minutes to toast coconut so no bathroom breaks. Peek in after 2 minutes, shake the pan a bit to mix it up, and put back another minute or two until brown. Add to bowl of nuts and set aside. Put dates into a food processor and pulse a few times to rough chop. Then turn on your food processor and let it go for several minutes until the dates get totally smushed, scraping a few times along the way. You want the dates as pureed as possible. Add vanilla paste/extract and puree a moment longer. Then add pumpkin, spices and pinch of salt, and pulse a few times until combined. Slowly add coconut milk, puree until smooth. Pour into a bowl and chill in refrigerator, or put into an ice bath to hurry up the process. When cold, pour into your ice cream maker and start processing according to manufacturer’s instructions. Now comes the fun part! To add chocolate flecks, melt chocolate double boiler style (I use a small bowl over a saucepan of warm water) and pour into a plastic bag. 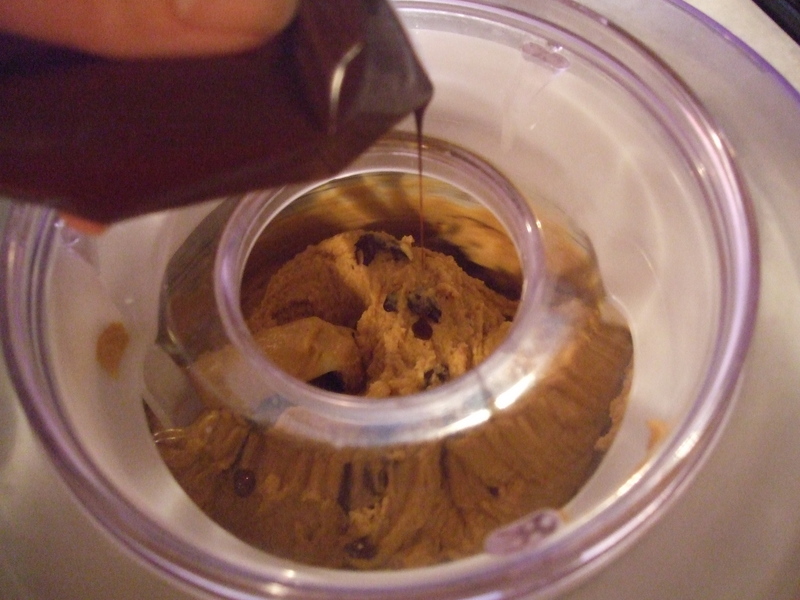 A few minutes before the ice cream is done, snip a small hole in the corner of the plastic bag and as the ice cream swirls around, slowly “flick” the chocolate into the mixture. The warm chocolate going up against the ice cream instantly freezes, making little flecks….. really! Have fun with it and don’t worry about getting a little chocolate on your countertop, it’s just part of the creative process! When you are happy with the amount of chocolate flecks you have “flicked” (ok, I couldn’t resist! ), toss in pecans and coconut and let them swirl together for a few minutes. By this time, your ice cream should be done. Spoon into containers and freeze. This ice cream will freeze to a very hard state, so be sure to take it out and set in refrigerator for about 20 minutes or so before serving. 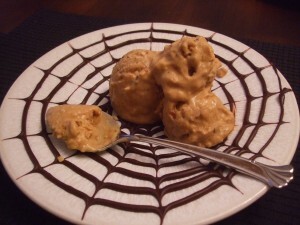 This ice cream is yummy anytime, but makes a great healthy (and Primal!) dessert for your holiday meals. Pumpkin Ice Cream is great plain, or with just the chocolate flecks. You can also substitute walnuts, and try a bit of maple flavoring in place of the vanilla. For those of us who can’t/won’t eat dairy products, ice cream has been a treat relegated to childhood memories. Now we can enjoy a cold, creamy treat that is not only dairy-free, but refined sugar-free as well. And with such an easy recipe, the possibilities are endless (not to mention that taste testing is awfully fun!). Either full fat or the lite coconut milk work fine, although I’m loving the lite coconut milk I can get at Trader Joe’s. 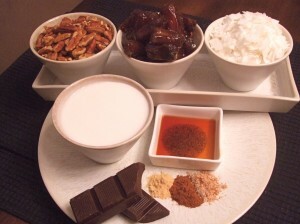 I am using dates as a sweetener because I have no tolerance for typical sweeteners. Dates are so naturally sweet you don’t need to use a lot. I use anywhere between 12-18 per batch, depending on other ingredients. It’s sweet enough for me, and I can have a small scoop without feeling that “sugar rush” or get any hot flashes, so that’s good enough for me! 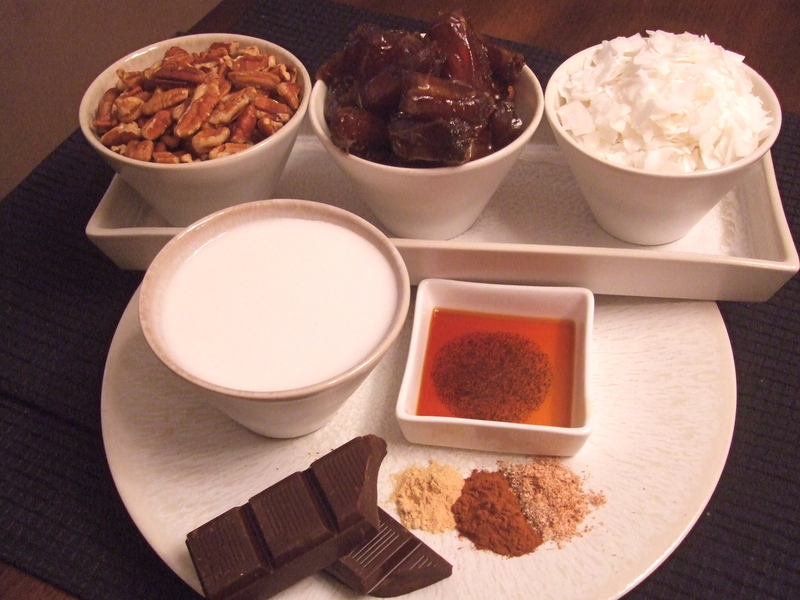 Approximately 15 dates, more if you like your ice cream sweeter, less if you are adding fruit, chocolate, etc. That’s it! This is simple to prepare, although best results require a food processor and an ice cream maker. First, put your dates into the food processor, pulse a few times, then turn on until they are as smooshed as possible. Not sure that’s a true culinary term, but you need to keep processing the dates until they first get broken up, then they form a ball, then they smear all around the sides of the food processor bowl. So…. smeared or smooshed, you get the idea. You can add your bit of vanilla extract or whatever flavoring you like to the dates and it makes it a bit easier to get to the smeared stage. Scrape all that down and add a bit of your coconut milk, and process so that the dates get incorporated into the coconut milk. Continue scraping, adding coconut milk and processing until it is as smooth as possible. Pour into ice cream maker and continue as directed by your machine’s manual. With mine, it takes about 15-18 minutes, then put in containers and freeze. Because homemade ice cream is really pure, it freezes very hard, so remove from freezer and either refrigerate for about 15 minutes or just set out on the counter for a few minutes before serving. Just don’t forget it, or else you’ll be so disappointed that it’s melted! This is a basic recipe, and it just begs for experimentation. I’ve added chopped peaches, chopped bananas, pureed mangoes, had it just plain with a bit of vanilla and almond flavoring, and made a wonderful coconut version using coconut extract and pulverized unsweetened coconut (about 1/4 cup worked fine). If anyone experiments, let me know what you come up with. Or if you have any suggestions on flavors I should try, you can always suggest…!